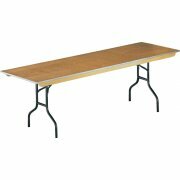 The plywood core on this folding table is lighter than particleboard, which makes these Plywood Banquet Folding Tables much easier to move around and stack. Wishbone style legs are steel-painted black. 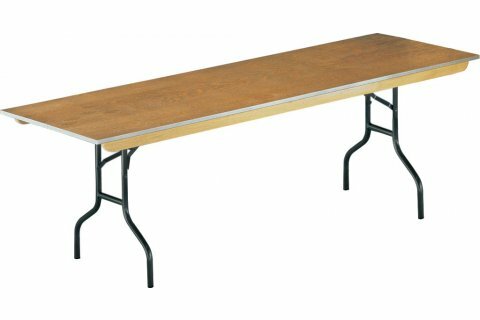 These folding tables last longer too! Strong: Double-cross bracing for maximum strength. Smooth Edges: Galvanized steel edges. Spill Resistant: Sealed with two coats of lacquer to repel spills. Sturdy: Steel apron bolted to top. Stackable: Extra-wide, through-bolted wood runners facilitate stacking and handling.